Recent decades have seen great progress in children’s health driven by leading-edge pediatric research, discovery and innovation. This progress has been made possible in large measure by the support of philanthropists, who have provided the risk capital for pediatric research, participated in public-private partnerships to achieve improved delivery of care and advocated for a healthcare system that takes into account the whole child, including such societal factors as poverty, the physical environment, approaches to learning and play. Whether the advances made are sustained and built upon will depend on choices made – by societies, institutions and individuals. 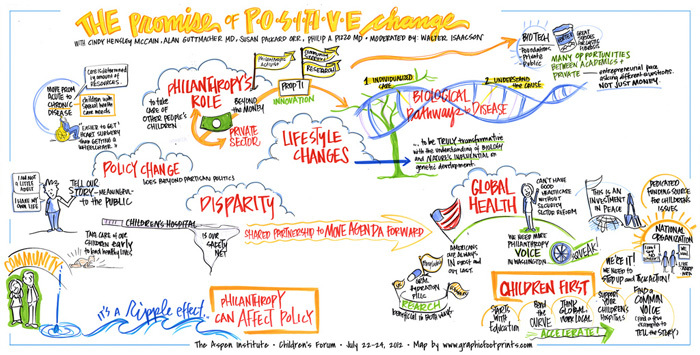 To help inform those choices, the Aspen Institute Program on Philanthropy and Social Innovation partnered with The Woodmark Group of 25 leading pediatric hospitals in the United States and Canada to host the Aspen Children’s Forum—Investing in Children’s Health and Well-being. The event, which was held in Aspen, Colorado from July 22-24, 2012, convened more than 300 philanthropists, scientists, policymakers, educators and healthcare practitioners to devise and advance an agenda of research, innovation and policy priorities that put children first. Track 1, A Children-First Approach to Diagnostics and the Delivery of Care, examined breakthroughs in diagnostics and clinical care in a world in which we put children first. Track 2, Discovery: A Children-First Research Agenda, explored promising research and discoveries within reach. Track 3, Popular Culture & Healthy Living: Learning, Play, Sports and Health Outcomes, spoke to society’s approach to nutrition, sports, education and the habits of healthy living. This track tweaked the imagination and reminded the audience of the impact of daily choices (or of having those choices limited). Track 4, Filling the Gaps in Policy and Practice, identified existing holes within the healthcare system and highlighted philanthropy’s role in advancing cross-sector partnerships to fill those gaps. In addition to panel presentations by cutting-edge thinkers in the various fields affecting children’s health, participants engaged in a scenario planning exercise that imagines a world in which the health and well-being of children is society’s top priority—whether it be in setting research and development priorities, devising public policies, or adopting new approaches to the delivery of care. In these scenario planning sessions, participants explored a variety of questions, including: What would the world look like if we were to put children first? What are the social, economic, and moral imperatives for doing so? How would we train the professionals who provide their healthcare and contribute to their wellbeing? What would our research priorities be? How would we prepare educators and caretakers and support families of the chronically ill? What would our philanthropic, public and private sector investments look like, and how would we collaborate across sectors with this common goal? The Forum was co-chaired by Susan Packard Orr, founder and CEO of Telosa Software and a trustee of the Lucile Packard Children’s Hospital, and Lester Crown, chairman of Henry Crown and Company and a director of the Ann & Robert H. Lurie Children’s Hospital of Chicago. The event was made possible by the support of the Woodmark Group of hospitals as well as Advancement Resources; Grenzebach, Glier and Associates; and Sterling Foundation Management LLC. Download the full event program. 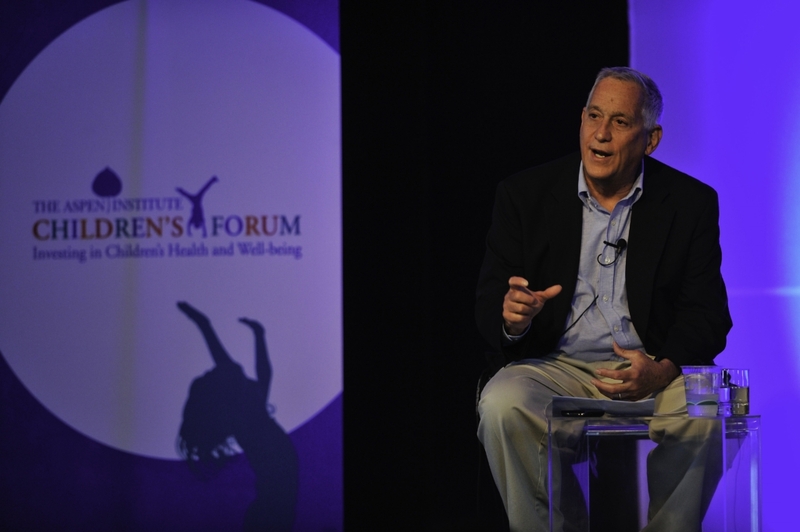 The purpose of the Aspen Childrens Forum is to build and broaden a consensus among philanthropists of all political stripes on ways to assure the health and well-being of children. Through a process of scenario planning, informed by expert briefings, these problem-solvers will be joined by practitioners.